1. How does the Beautiful Schools service work? We will then check a few details, including availability, with the school and get back to you with further details within the agreed response time. 2. Why should I use Beautiful Schools? Beautiful Schools opens the doors to venues you may previously not have considered booking, creating a new realm of unique opportunities for your guests. Schools can cater for such a wide variety of event types and needs as well as boasting some of the best facilities in the UK, from golf courses to state of the art concert halls. They are often situated within beautifully designed buildings of architectural merit. 3. Is there a fee to use the service? No, Beautiful Schools is free to use. 4. Will I be able to liaise directly with the venue? Yes, once you and the team at the school are happy with the details we have shared we will pass on the respective details so that you can liaise directly. The Beautiful Schools team will always be available as background support if needed. 5. Can I bring in external suppliers for my event? This will vary for each school. If you have any special requirements or requests let us know and we will share the information with you once you have made your enquiry. 6. If my event is outside of term time, what support will be on site from the school team? We will ensure there will be an informed member of the school team on hand during the planning stages of your event and on the day(s) of the event. Additionally, some schools now have external events team who will be able to support – this varies across the portfolio and we can inform you of more details for the venue you choose. 7. Can Beautiful Schools guarantee the quality of the school I book?  Beautiful Schools runs a site audit of each school which results in the full list of photographs and facilities associated with the venue. Site visits can be organised directly with the venue once you are in contact with them.